‘I have set myself against the Infinite… I am nothing… I understand nothing except that I have no self any more. But this is life’ (pp. 267-8). Maskull, the protagonist of A Voyage to Arcturus, appears at the séance in Hampstead which begins the work with little by way of introduction other. than a cursory description of his appearance. In fact, it is not until he is on his way north to the Starkness observatory from whence the titular journey is to be undertaken in the company of Nightspore that the reader comes to understand that they are in the presence of the central character. David Lindsay’s lack of interest in Maskull’s history and motives should signify to the reader from the start that this is a work focusing on concepts rather than characters. However, the concepts that the author wishes to attempt to map out are none other than the nature of the individual’s physical and spiritual interactions in an evolutionarily fluid universe without a moral compass, or to invert the paradigm, with an ‘amoral compass’. The latter may sound tautological, but in Lindsay’s Tormance, it makes sense. The vaguely allusive names of the characters and locations add to the reader’s apprehension that they stand on the threshold of understanding what the work is about, only to find their interpretations unravelling as the next contradictory sequence commences. Maskull’s journey north through Tormance is a ‘tortured romance’ of a sort, torturing the expectations of the genre in as much as there are elements of chivalry, courtly love and religiosity, but also misogyny, murder and iconoclasm: ‘They had forced him to murder and violate… he had guessed nothing, but had imagined he was travelling as a free and enlightened stranger… what was this nightmare-journey for… and would it continue in the same way?’ (pp. 141-2). The unidentifiable, perhaps even indefinable, qualities of meaning in A Voyage to Arcturus serve to buttress rather than undermine this subtle work’s desire to decentre our moral and sensory ontologies. This is an enterprise entered into by both author and reader in a spirit of inquisitive despondency, as it is an endeavour without a resolution, with each new ontological state leading to another, beyond death, beyond renewal, beyond time, the dimensions of which are not measured in units of distance but where ‘length is existence, breadth is relation, [and] depth is feeling’ (p. 206). If this work’s afferent impulses get on your nerves then this is, perhaps, Lindsay’s point. 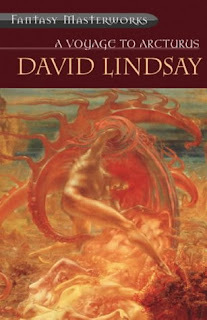 Each character Maskull encounters may serve to offer him some sort of spiritual insight, but rather than their concatentation in a world-view explicating Lindsay’s vision of Tormance’s moral alterity, they merely supersede each other (‘You brought your soul with you, but that’s altering fast too’ (p. 122)), another contributing factor to the ebb and flow of the planet’s ceaseless, perhaps purposeless, creation and destruction. Lindsay’s singular vision is seductive, but not to the point where the contemporary reader isn’t troubled by some of the work’s less palatable characteristics. A deep-rooted misogynism pervades A Voyage to Arcturus, with numerous female characters introduced only to die at Maskull’s hand or to sacrifice themselves on his behalf, which he seems to observe at arms length rather view himself as the progenitor of: ‘now you understand the sort of man I am. Much brutality, more weakness, scant pity for anyone… Oh, it has been a bloody journey!’ (p. 245)). The suggestion that this behaviour is no more than a facet of humanity in its totality, with masculine violence offset by feminine nurturing (although this simplistic binarism is, in true Lindsay style, demolished elsewhere in the work) is neither justified nor explained by the appearance of a number of hermaphroditic, gender-ambivalent characters later in the work as another source of Tormance’s evolutionary, biological morality. Like the windows in the stairwell of the Starkness observatory, the author does not fail to provide many alternative positions to observe the work from, although most of them serve to deliberately sabotage and devalue its central themes. Krag, for example, scornfully remarks towards the book’s end that ‘while you have been murdering and love-making, we have had our work’ (p.. 257), jarringly suggesting to the reader that the ‘real’ struggles framing the book have taken place outside of the main narrative. The author is not only averse to but arguably obsessed with exploding the idea that whilst the work is in some ways a quest for personal enlightenment, that there are no moral absolutes to measure one’s own aspirations and resolutions against: ‘men who live by laws and rules are parasites. Others shed their strength to bring these laws from nothing out into the light of day, but the law-abiders live at their ease – they have conquered nothing for themselves.’ (p. 243). Elsewhere, to Maskull’s observation that ‘the individual spirit which lives and wishes to live is mean and corrupt-natured’, Spadevil replies ‘Guard your pride! Do not make law for the universe and for all time, but for yourself and for this small, false life of yours’ (p. 129). In other words, to embark upon a quest to identify and define moral absolutes to guide humanity in its entirety is futile, and one should live one's own life according to one's own principles in a spirit of self-justified individualism: 'by our deeds may others judge us'. But then out of which character’s mouth do these observations come? A ‘spayed devil’, a neutered mouthpiece for evil thoughts (but then what is left when ‘evil’ is removed, and nothing left in its stead? ), or a ‘spade devil’, inferring that we merely have to scratch in the moral dirt to disclose our own ignoble qualities? A Voyage to Arcturus’s disdain for the individual’s ‘small, false life’ seems to echo not only the author’s morbid fascination with attempting to discern the character of the Blakean ‘immortal hand or eye / [that] framed [the] fearful symmetry’ of the universe (‘how comes this horrible world to exist?’ (p. 139)), but also a Beckettian perception of the futile yet inescapable struggle of living: ‘How this sordid struggle for an hour or two of physical existence could ever be regarded as a deeply earnest and important business, was beyond his comprehension’ (p. 185). Furthermore, Lindsay suggests that Maskull’s is a world in which ambitions have decayed, and notable achievements are no longer attainable: ‘there is no longer any spirit of adventure amongst the Earthmen. Everything is safe, vulgar and completed’ (p. 244); ‘all the delicacy of the dawn vanished, and another vulgar day began’ (p. 256). This passage effectively destroys the possibility of reading the work as part Bhuddist parable, part Gnostic exegesis as we come to an understanding of the fact that Maskull is not a reliable lens through which to view the merits of the other characters he meets and the moral and spiritual positions they represent. There is a critical ambivalence throughout the work framing most of the encounters that Maskull has with the inhabitants of Tormance as to whether Shaping / Surtur / Crystalman is a force for good or evil, and whether Krag is or is not synonymous with the demonic. There are, in other words, no adamantine moral absolutes to refer to throughout the work. However, the baldly stated references to a ‘Devil’ and a ‘God’ in the passage reproduced above sweeps away at a stroke the trope of the fallibility of perception that appears up until this point to have been so central to the work (the ever-changing shade of Joiwind’s complexion, the fading and heightening of Sullenbode’s features, the indeterminacy of the meaning of the Crystalman death-mask to name but three from scores of examples), the finality and decisiveness of which appears to extirpate the possibility of ever being able to discern between them. If this is the case, then the ‘grim death-struggle’ will be an eternal one, and the reader is left to reflect on the fact that on Tormance, as on Maskull’s earth (and if we view the protagonist as an Everyman figure as his name invites us to, in our own heads), there is nothing but life and death, creation and destruction, ceaseless, inexplicable, neither just nor cruel but merely existing simultaneously in an eternal ontological present. In conclusion, it is often difficult to discern whether the reader is engaging with a work of madness or of genius when reading A Voyage to Arcturus. This is an uneasy notion which is only amplified by the lysergic, hallucinatory character of the work, during which Maskull develops numerous appendages affording him new, extra-sensory abilities, and enters into several trance-like dream-states at various points in the narrative: ‘Maskull bit into the root. It was white and hard; its white sap was bleeding. It had no taste, but after eating it he experienced a change of perception’ (p. 207). Overall, however, it is a rich, perplexing, contradictory, disturbing and provocative book, and a very fine entry in the Fantasy Masterworks series. This book is beautiful, terrible, haunting. A life-changing experience in some indefinable way. I know I will read this book every few years and always fall into its spell and be utterly crushed by its ending. This review is probably the best and most accurate (if that's the right word) I've seen on the nEt. Thank you for having taken the time to leave a comment, and for its generosity. Lindsay's book is one of the most extraordinary works I've ever read. I am in awe of its power to provoke and decentre. I think that those of use who have been lucky enough to have encountered it are fortunate indeed.